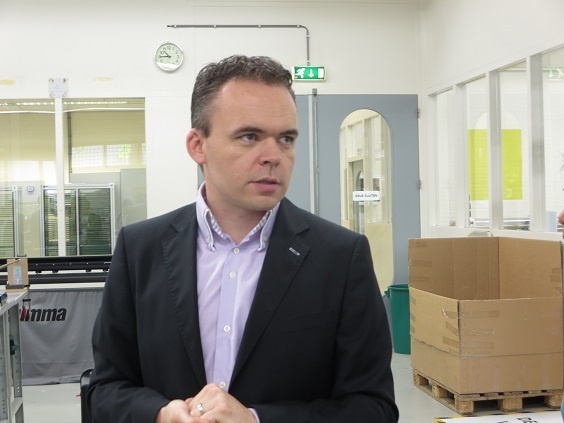 DEONET, The Netherlands | Mimaki user stories | Case Study | MIMAKI SINGAPORE PTE. LTD.
DEONET: Printing on goods, such as USB memories, with wide-format flatbed inkjet printers. 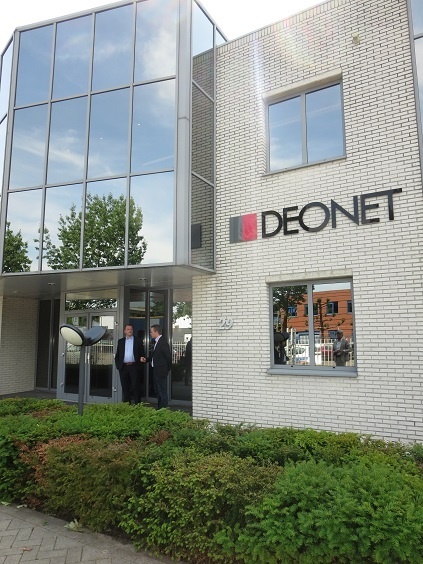 This time, we visited DEONET, a company founded in 1991. Its head office and factory are located in Eindhoven, the Netherlands. From Eindhoven, the company exports its products to more than 60 countries around the world. Eindhoven is famous for the fact that various companies are based at the city. Such companies include Philips (a global electric manufacturer) and DAF Trucks NV (a truck manufacturer). The main business activity of DEONET is production of promotional items. By using inkjet printers to output designs and logos, the company produces customized products, such as USB memories, mobile batteries, key chains/fobs, and ballpoint pens. Inkjet printing adds great values to goods by printing customized designs. Its main clients are advertising agencies and net-shop business operators. Mr. Mike Verjans, CTO of the company, showed us over the head office and factory. We were amazed at production scenes in the factory. 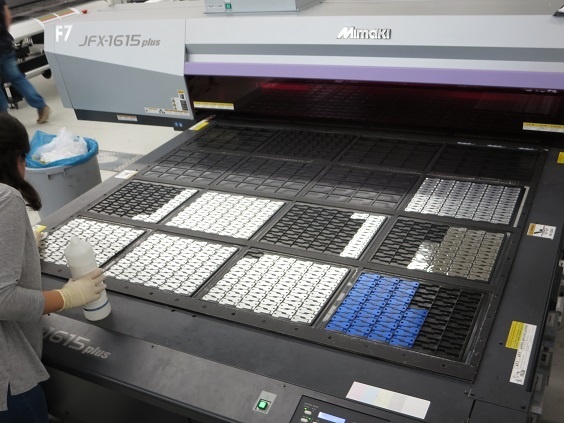 It is equipped with “JFX-1615plus” and “JFX200-2513” (Mimaki’s super wide-format flatbed UV curable inkjet printers). The printers print on USB memories, ballpoint pens, and other products. These goods are mounted on jig/fixture plates that are placed on the print tables. 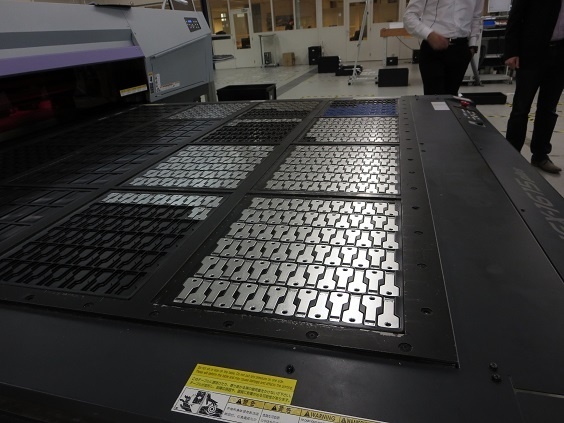 In Japan, the super wide-format inkjet printers are usually not used for the production of small goods. However, in DEONET factory, such printing productions are handled on a daily basis. Placing jig plates on the large flatbed inkjet printer. 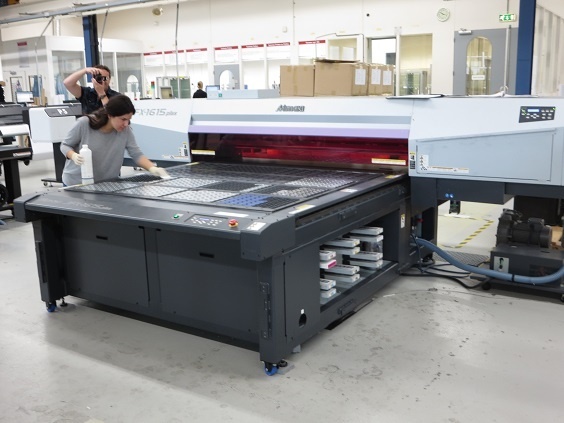 In Japan, these super wide-format flatbed UV curable inkjet printers are generally used to produce posters, boards, signs, and other large items. Generally, compact inkjet printers such as “UJF-3042” and “UJF-6042” are used for printing on small goods. Therefore, we were really amazed that DEONET uses the super wide-format inkjet printers for printing on small goods. CTO Verjans explains reasons for this unique production method as follows. One “JFX-1615plus” and four “JFX200-2513” are installed in the factory. Each printer is operated by one dedicated operator to produce many products. 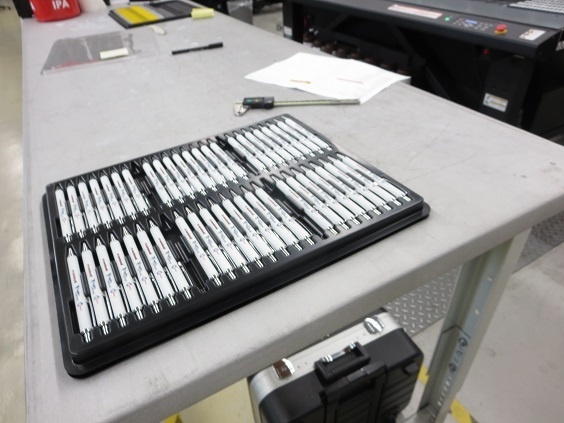 16 jig/fixture plates can be placed on one “JFX-1615plus” and the 20 plates can be placed one “JFX200-2513”. 70 to 80 small USB memories or approximately 50 card-type USB memories can be mounted on the plate. This means that 900 or more USB memories can be produced at one time. One inkjet printer handles multiple different print jobs by utilizing its productions know-how including optimal nesting. When clients are in distance places, we use PANTONE for color matching. Color data are steadily accumulated and controlled, and color differences among printers are calibrated by using color charts. DEONET is also characterized by the fact that a large number of female operators are working at the company. Goods, such as USB memories and ballpoint pens, are not mounted onto the plates at DEONET. Almost all of them are mounted at subcontractors and then transported to DEONET. Due to high labor costs in Europe, mounting goods onto jig plates at DEONET would be unprofitable. Particularly, the company doesn’t want to spend time and cost of their highly-skilled operators for simple works. Goods are mounted onto the jig plate at subcontractors. 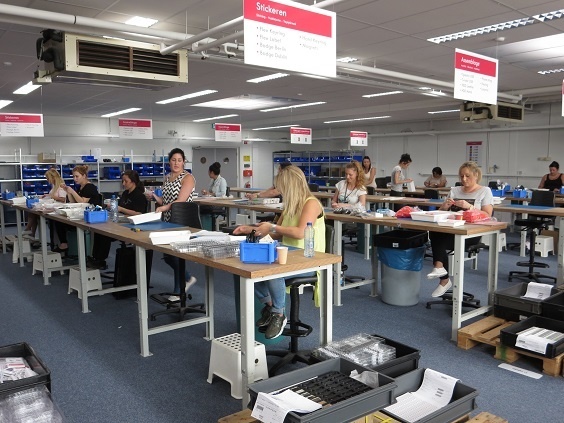 In the finishing section, up to 60 employees work during busy periods. After printing, some of the goods are shipped immediately after printing, and others are sent to assembling, packaging or other processes at DEONET. On that day, in the finishing room, 16 female employees were assembling, inspecting, and packing card-type USB memories. We have heard that it was a low season at the time of our visit to the company. In the peak season from September to December, up to 60 persons will be engaged in finish operation in three shifts around the clock. 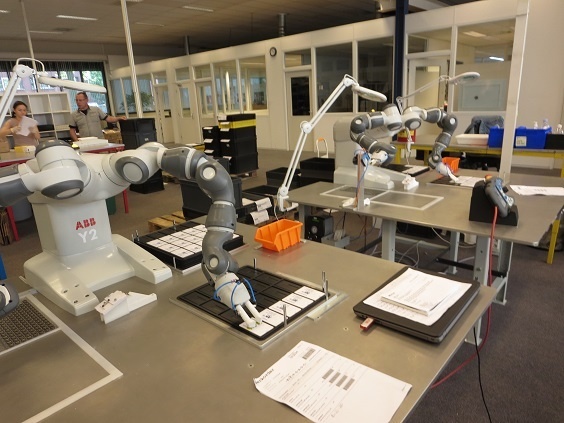 One month ago, DEONET installed one robot (arm-type robot) to assemble card-type USB memories. This robot completes 3000 to 3500 USB memories per day (eight hours), which production volume is slightly larger than that of humans. Robots require initial cost for installing but do not need any education. Additionally, there are no technical differences between robots, and they can work around the clock without fatigue. Particularly in Europe, where the pay level and social security spending are high, it seems that final cost can be reduced by introducing robots. Recently, DEONET installed the arm-type robot. They are promoting factory automation. The number of robots is scheduled to be increased to five. In 24-hour operation under control by one employee, these robots are expected to automate work that is done by 15 persons or more. DEONET is scheduled to introduce Mimaki Engineering’s high-end UV curable inkjet printer model “UJF-7151 plus.” The company is considering creating new business by combining this inkjet printer and robots.